Can Joel Embiid stop playing pickup games against goofy idiots before I have a heart attack? Joel Embiid took to the courts of Philadelphia over the weekend on a whim and decided to slaughter all of the goofy white guys who dared get in his way. The videos, captured in all of their ball-busting glory on Twitter, are fabulous. So good. I could watch them all day long. Jesus Christ. All I can think about watching these clips is Joel dunking on some loser, coming down from the rim and landing on someone’s foot and tearing every single ligament in his knee. For anyone playing basketball in South Philly where Joel has been known to show up, if you see the big man strolling over to the court to play you should be courteous, let him into your game, and for the love of god don’t play any defense against him whatsoever. Do you really want to be caught on someone’s iPhone as the guy Joel lands on and misses the next season because he tore his ACL after you gawked at his windmill dunk and didn’t get out of his landing zone? 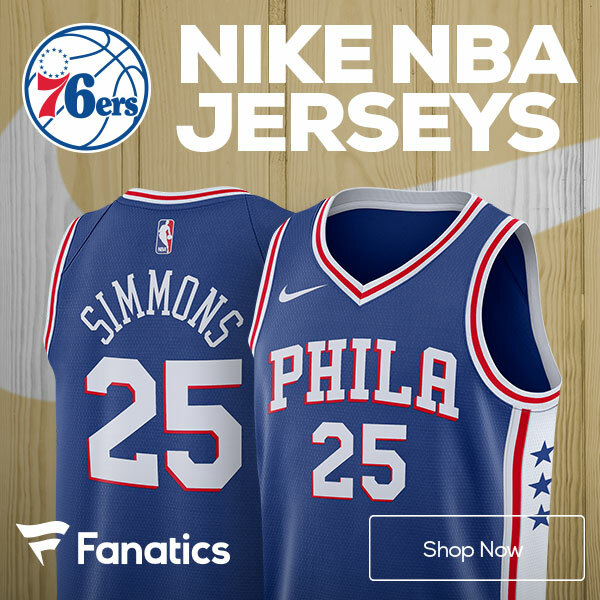 Because if you do end up as that guy you’re going to be drawn and quartered by the furious Process Trusters in this town for ending the 76ers next season before the summer league. Get out of his way, let him throw down a dunk, take a selfie, and then thank god that he didn’t get hurt on your court. I’m breaking out in a cold sweat just thinking about it. You know what won’t make you nervous? Awesome Phillies merch. 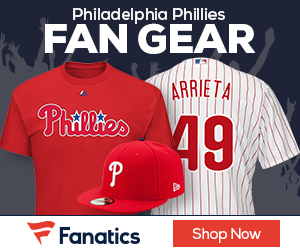 Click the Phillies banners below to buy some awesome Fanatics Phillies merchandise for Father’s Day. Embiid, god damnit, you can not become all chummy with anyone in the Ball family. Everyone enjoyed it much, much more when you were lobbing horrendously funny tweets at that melonhead’s futile efforts to keep his sons relevant and in the public eye. Hello, I’m Sarah McLachlan. Right now, the Lakers need you more than ever after what happened last night against 76ers. Your call says, I’m here to help. Please call, right now. Ben Simmons and Joel Embiid should be locked up after the severe beatings they doled out over 48 minutes. It was so cruel, so brutal, the duo had to flee the state and the premises of their crime before local law enforcement officials could apprehend them. Please call to put a stop to the violence you can see after the jump. Joel Embiid’s minutes will be “in the teens” … AND HERE COME THE PRETZELS! Oh boy. Oh boy oh boy oh boy. In a press conference today Brett Brown noted that he believes Joel Ebmiid’s minutes in the first game of the season on Wednesday against the Washington Wizards will likely only be “in the teens” … and the panic button has been pressed. It was surprising news for Embiid, who told reporters he was “bummed” and could likely play upwards of 30 minutes in the opener, but would have to abide by the minutes restriction. Did anybody really expect him to have no minutes restrictions in the opener? He’s played less than 25 minutes all preseason, but somehow he’d be cleared to play 35-plus in the opener? Uhh…no. No he would not. But that didn’t stop pretzels from raining down on poor Brett Brown. And the fans do not like this one bit! AND HERE COME THE PRETZELS! Head Coach Brett Brown now on the field, pleading with the fans for some kind of sanity. And a barrage of pretzels now knocking Brown unconscious. Wow. This…this is a black day for basketball. I am here and now declaring “AND HERE COME THE PRETZELS!” to be the official statement for any time Philadelphia fans overreact on Twitter.